I became enamored with making banana bread when I heard that the best fruit to use are the black-skinned, overripe, bananas that usually end up in the trash. There's something wholly satisfying about turning what would have otherwise been disposed of into something the kids fight over getting the first warm slice, fresh from the oven. Of course, I could do without the children fighting - but you get my piont. Grease a 9"x5" loaf pan and pre-heat your oven to 350 degrees. In a large bowl, combine the white flour, whole wheat flour, baking soda, and salt. Using a stand mixer and the wire whisk attachment, whip two of the bananas and the sugar together for 2-3 minutes on high speed. Add the eggs, melted butter, milk, orange zest, and vanilla and mix well. Add this to the dry ingredients and mix by hand until just combined. Mash the remaining two bananas with a fork, leaving some good sized chunks, and fold into the rest of the mix. Pour batter into your loaf pan and bake for about 1 hour and 15 minutes. 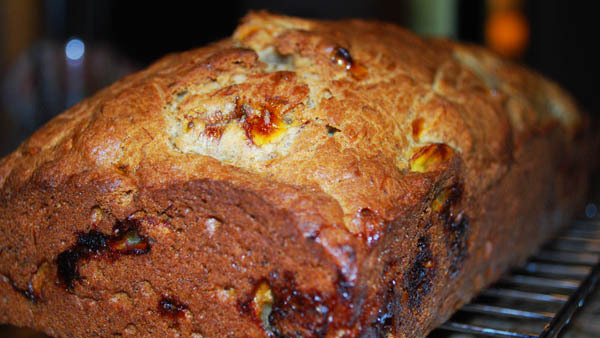 Banana Bread is done when a knife inserted into the middle comes out clean. Cool on a wire rack for 10-15 minutes before giving those unruly kids a slice.